I bought a plain black crossbody purse for carrying supplies but she prefers taking it in her lunch box to school, she will have to use the purse for field trip next week and other times we go out. My daughter carries her log book with her too so she has all her number with her, I log them daily to the dr./hospital site. We’ve been looking for a good app to do this but haven’t found one yet. Otherwise we just keep plugging along. I will enjoy reading other hacks though. You’ve probably already figured this out, but it’s my opinion that if a “hack” works for you then it can’t be considered wrong!! I love the idea of remembering not to overdue free proteins – I find I reach for them when my blood sugar is high and I’m hungry, but you are right, too much and they aren’t really free. Thanks for the reminder. 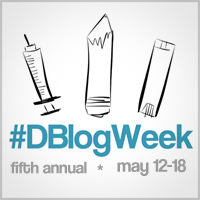 And thank you so much for joining in on DBlogWeek – I can’t tell you how delighted I am that you are participating!! I hope you are making a lot of new friends in the Diabetes Online Community (DOC). Thanks Karen. This week has been amazing, I was having trouble finding the DOC and participating in the DBlog week has helped. I think I read every entry today and noticed you left comments for everyone which is really wonderful of you. Well I really appreciate all of the enthusiasm and support everyone has for DBlogWeek so I really try to comment as much as I can. If you guys can all take the time to write during this event, then I can take the time to comment. I’m way behind, but I hope to read every single post from this week. 🙂 Thanks a ton for participating. And yup, Karen is pretty wonderful! On the app side, MySugr is definitely a great app, motivational and logs your numbers very well. Sending good thoughts your way, since this all is new for you! This is so cool! To read about things from three weeks in…thank you for sharing! Like you, I started to blog up on diagnosis. It is really fun to look back at myself from 2 years ago—I think you will really love being part of this online community!